Sensei Carlos Trujillo has been training with Shihan Danny Trujillo since he was 3 years old! Now a 4th degree black belt, Carlos has competed on a national level, and has trained a stream of competitors who have carried on his success!! 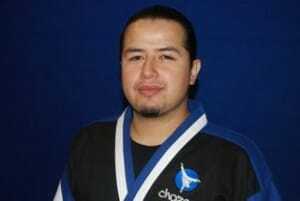 Carlos is now not only the leader of Chozen Martial Arts San Dimas, but also spends time as a very succesful DJ, as well as a participant and emcee for tricking and dance events. Carlos has learned from the best not only in the martial arts, but also in training techniques. Carlos has studied with industry leaders like Greg Silva, Barry Van Over, Roland Osborne and Mike Chat. He brings an amazing blend of traditional martial arts, cutting edge competition skills, and true expertise in instruction of all ages.